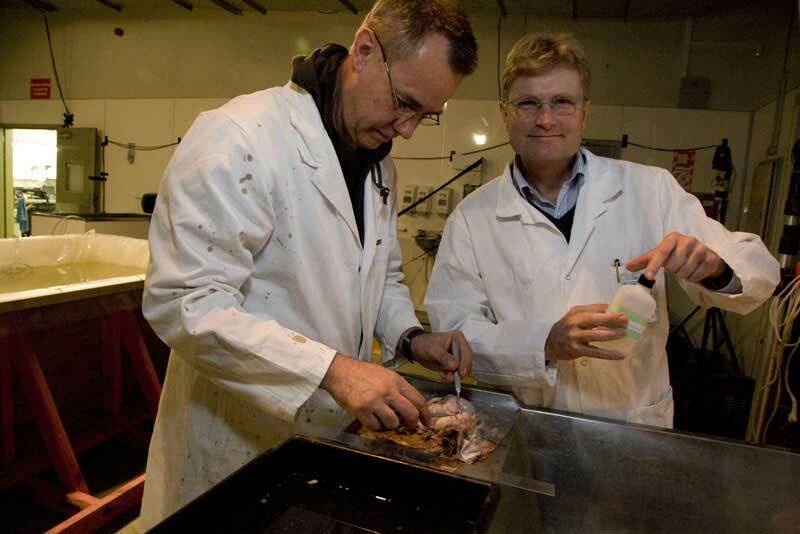 My name is Prof. Eric Warrant from the University of Lund in Sweden (blonde hair, blue glasses), and I am here together with Prof. Dan Nilsson (also from Lund) to study the gigantic eyes of the colossal squid. These are truly amazing eyes – in the collapsed state we see here, they measure 25 cm across, but in the living animal they are probably larger, up to around 30 cm in diameter (the size of a soccer ball). These are without doubt the largest eyes that have ever been studied (and probably among the largest eyes that have existed during the history of the animal kingdom), and it is tremendously exciting for Dan and I to be here in Wellington. The eyes of cephalopods (squid and octopus) are very much like our own, “camera eyes” that contain a single lens that focuses images onto a retina lining the concave rear surface of the eye. We have removed the lens from one eye, and as in all cephalopods, it consists of two halves. In the pictures showing two “lenses” we are in fact looking at the two halves of a single lens. They are somewhat degraded, and these two halves probably represent the higher refractive index core of a larger lens – the jelly-like coating around the lens (of lower refractive index) has most likely disappeared. 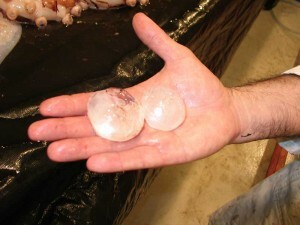 When this squid was alive, the lens was almost certainly spherical and possibly of a size similar to an orange (ca. 80 – 90 mm diameter). The “optic lobe” of each eye is the part of the brain that processes the visual information coming from the eye. 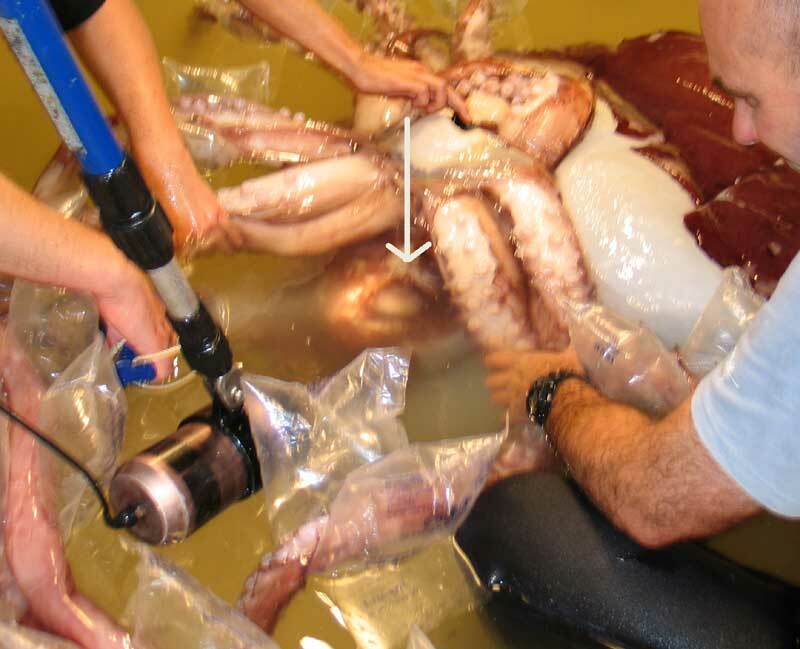 Even though we have not yet had the chance to look at the optic lobe in this Colossal squid, we did have access to the optic lobe of a considerably smaller Giant squid (Architeuthis dux). Its optic lobe was the size of a small sausage – larger in size than the entire visual cortex of a human (the visual cortex is our “optic lobe”). The optic lobe was also much larger than the remainder of the Giant squid’s brain, and shows just how important vision is to these huge squid. I suppose the question on everyone’s mind is why these squid have such enormous eyes? Firstly, by having huge eyes it is possible to have huge pupils, and a huge pupil (in our Colossal squid probably around 80 – 90 mm across) allows the eye to collect every last photon of light in the incredibly deep and dark waters where it lives (ca. 1000 m below the sea surface – human visual threshold would occur at a depth of around 500-600 m). Large eyes also allow the possibility of high spatial resolution (the ability to distinguish spatial detail), although it is possible that neural mechanisms in the optic lobe sum signals from groups of neighbouring photoreceptors, thus making the visual “pixels” larger, but also much brighter. Thus with enormous eyes, and a large and complex optic lobe, giant deep-sea squids, like the colossal squid we are studying here, have the potential for advanced vision in the profoundly dark depths where they live. This ability would be potentially useful for many tasks, including the detection of prey and predators, and for seeing each other. Do the squids you are studying have chromatophores? If not, then my thoughts are not of much value. If, however, there are chromatophores present, then there is a possibility that the squid has such a vision advantage over prey, competitors and predators, that camouflage is unnecessary. The next likely theory might be the eyes are so advanced to facilitate communication between squids in their nearly lightless environment. We really need more data. How do these creatures hunt? Are they solitary (hunters) or are they social? What is the ontogeny of these critters? Is there cooperation between younger and older specimens? A hierarchical cooperation? How do they choose a mate? I am fascinated by the creatures and excited by your research. i dont see a pupil!! thatz real interesting i am currently working on a project for science and i am finding alot about the eye.. The eye of the squid is morphologically similar to that of vertebrates: this is sometimes used as an example of “convergent evolution.” The general idea being that the benefits of having an eye with particular features are so significant that any adaptation that leads to those features will be selected for, so even when two groups of organisms (cephalopods and vertebrates in this case) have arrived at the basic structure for an eye through independent evolution, there will be a very strong pressure to reach a similar morphology, because that morphology conveys a definite advantage. Early research into genes found that organisms as diverse as fruit flies and vertebrates had the same HOX gene code for eyes. Therefore, it seems that primitive eyes developed in the common ancestor of all bilaterally symmetrical animals, which then developed independently into the more advanced eyes in cephalopods and vertebrates. The lens, pupil, and retina arrangement is effective and developed in both cephalopods and vertebrates – while the basic structure is the same, there are significant differences in the focusing lenses and arrangement of the receptors on the retina. In one way the cephalopod eye is better than that of vertebrates – the photoreceptors face the light, and they do not have a ‘blind spot’ found in vertebrates where the retina is ‘backwards’. Despite this, the vertebrate eye still works well! Great and huge gigantic eyes of the colossal squid..Just think how great resolution they have. They can view objects more clearer that any other nay other animal. Nature’s another greatest creation. There really shouldn’t be any mystery as to why the eyes are so large. It’s exactly the same principle at work in astronomy: you don’t have much light, so you need a bigger telescope. The fundamental factor at work is the surface area of the lens; it’s what gathers all the light together. A bigger lens gathers more light. The squid’s problem is that the usual methods for accumulating light (time accumulation or using big photoreceptors) aren’t an option. It therefore seems almost a necessity to have some sort of neural mechanism for post-processing the photoreceptor output. Basic engineering principles lead me to suspect that there’s some snazzy processing going on in that optic bulb. . . all the better to see you with . . . . They eyes are amazing – Eric and Dan – the eye specialists who were here – said yesterday in their lecture that they are not sure why the colossal squid needs such big eyes. There are other deep sea creatures who don’t have such big eyes so understanding how these eyes work may help us understand more about the squid’s life. These deep sea creatures are still such a mystery to us – yet deep, black ocean with no light makes up most of the ocean on the planet. This is why it is so interesting for the scientists to get an intact specimen to take a look at. this is just amazing, I just love these sensational nature stories!What can we learn from this animal, and his eye? And why does it need to have such big eyes? If detecting and analyzing faint light sources is the squid’s problem, a good analog might be the processing performed on signals picked up by the SETI project. Thanks, Howard. Yes, most of the basic edge-processing and motion-detection is done right in the human retina, and that kind of processing is so simple that it’s likely done in this creature’s eye as well. In the frog’s eye, motion detection is about the ONLY form of processing. However, the process of combining multiple inputs into a single joint signal is easy ONLY if it’s fixed: you always use the inputs from a specified group of input cells (I assume they’re only rods in this animal) to calculate the value of a single super-pixel. If you want variable combinations that can be assembled in real time, you need some pretty fancy neural circuitry — or at least, I think you’d need a lot of neurons to do that job. Human vision is very complicated, because it handles things like parallax vision (calculating the range to nearby objects), texture-mapping, and some really sensitive color processing. I doubt any of these would be of value to our squid friend. His environmental challenge is to detect extremely faint moving signals. So long as he’s worried only about single-receptor detection, it’s all pretty simple processing, but if he needs to correlate lots of signals from lots of receptors, then suddenly there’s a lot of room for some really sophisticated processing — which may explain the large size of the optic bulb. While we are obviously never going to be able to hook up one of these squids into equipment in a lab, I wonder if we can’t do some comparative anatomy. Is there any correlation between visual processing size in deep-sea creatures and the light-level in which they operate (correcting for retina size)? It might be useful to carry out specific calculations for a group of animals operating at different depths, taking into account the size of the lens, the focal ratio of the system, the size and density of the photoreceptors, and the relative size of the optical processing system behind the retina. In response to Chris Crawford above, your speculations are certainly plausible – not from any particular knowledge I have of squid – but because your own visual system does very similar things. Not so much the dynamic tradeoff bit, but our brains process the data from our eyes using mechanisms similar to Photoshop edge-detection filters to take note of horizontal and vertical lines to aid in orientation, mechanisms akin to MPEG-2 video compression to detect and focus on motion, and a number of other mechanisms, including those that cause the ‘tired eye’ effect in play in many optical illusions regarding motion and color. As Peter pointed out, actually answering those questions cannot, at this point, be done with dead flesh – however, I will point out that a mere pixel-averaging sensitivity maximizer would not need a large visual cortex or optic lobe at all, as that sort of thing could readily be done via averaging inputs within the retina itself, before the data is passed back down the optic nerve. So there is almost certainly more going on than merely maximizing sensitivity to light. As a Kiwi scientist in exile I would just like to thank the team at Te Papa for putting on a fantastic event, very well done everyone. And a very nice description of the eye and optic lobe Eric. I can certainly understand your excitement. After all this is one of the delights of science, seeing and realising something nobody has seen before and as Chris Crawford above shows, discoveries lead to fascinating further questions. The answers Chris would probably require live physiological measurements on a live, awake, interacting squid…. I have a question based on a speculative realization I just had. You mentioned the idea of combining signals from neighboring retinal cells to trade off resolution for sensitivity. This is in fact a familiar concept from astronomy, but in this context it makes possible something much more interesting. What if the that huge optic lobe exists to provide DYNAMIC trade-off between sensitivity and resolution? In other words, the squid would usually operate at a very high sensitivity, low resolution mode, scanning for anything in the dark, but once it locks onto something and approaches it, the sensitivity is lowered and the resolution is increased. One other very interesting possibility is that this large optic lobe also does some very complex image processing by combining signals from neighboring retinal cells in different combinations, thereby extracting more information from the overall signal. Think of all those image-processing algorithms used in Photoshop or in astronomy image-processing; what if the squid’s optic lobe is implementing some of these algorithms? Hi from Fort Collins Colorado in the United States. Very impressive one problem I had was my link put me to the silent cameras and then back and forth and so I missed alot but it was very cool and I showed my daughter. I have to go it is 3:30 am here. Thanks again NZ team! Thanks so much for your very kind comments about my review – nice to know that you guys like it so much (he says with a red face 🙂 ). As for more technical details about the eyes, I am afraid we can’t say much more as yet. We have taken samples from both the retina and the optic lobes, but we would not like to disturb the eyes too much more because the museum is planning to display the specimen eventually and it would be a great shame if we damage the eyes. However, we can definitely say that these are the biggest eyes that Dan and I have ever seen, and likely ever to see, so this has been the thrill of our lives! highly recommended for anyone who is interested in this sort of thing! Monty, Obsession is the proper word. If the interview with Kat that was just on was recorded, would it be easy to make the audio into an mp3 file or similar ‘podcast’ format? I really liked what I heard, but it was popping in and out, and I understand that most viewers were having similar problems. I really think the commentary adds a lot of value, and I expect it’s even better for people who are new to squid biology! Still unconfirmed if it is male or female . . .
Rumour is abounding that this squid is male…….is it? Plastination is the replacing of fats and water with plastics so that they don’t decay etc and the cells retain all of their features. Formalin preservation preserves the gross specimen so it doesn’t decay but cellular features etc may be lost or damaged. Usually once the specimen has been “fixed” in formalin it will be stored in alcohol (formalin is very nasty stuff), not sure what the plan is here for storage, but plastination would be mega expensive! Is formalin preservation the same as ‘Plastination’? I heard about the Plastination from an exhibit at the Boston Museum of Science in which the specimens (human bodies in this case) were ‘plasticized,’ turned into some sort of plastic I suppose. PS – thanks for adding the audio and especially the narration/commentary that I am listening to right now, very informative! OK now I get it two lenses per eye, should’ve read more of the other parts of the blog! Is one lens bigger than the other? Is one eye bigger then the other then??????? ?